After some 180 days of running and four hundred trillion proton proton collisions, the LHC's 2011 proton run came to an end at 5.15pm October 30th. For the second year running, the LHC team has largely surpassed its operational objectives, steadily increasing the rate at which the LHC has delivered data to the experiments. At the beginning of the year's run, the objective for the LHC was to deliver a quantity of data known to physicists as one inverse femtobarn during the course of 2011. The first inverse femtobarn came on 17 June, setting the experiments up well for the major physics conferences of the summer and requiring the 2011 data objective to be revised upwards to five inverse femtobarns. That milestone was passed by 18 October, with the grand total for the year being almost six inverse femtobarns delivered to each of the two general-purpose experiments ATLAS and CMS. 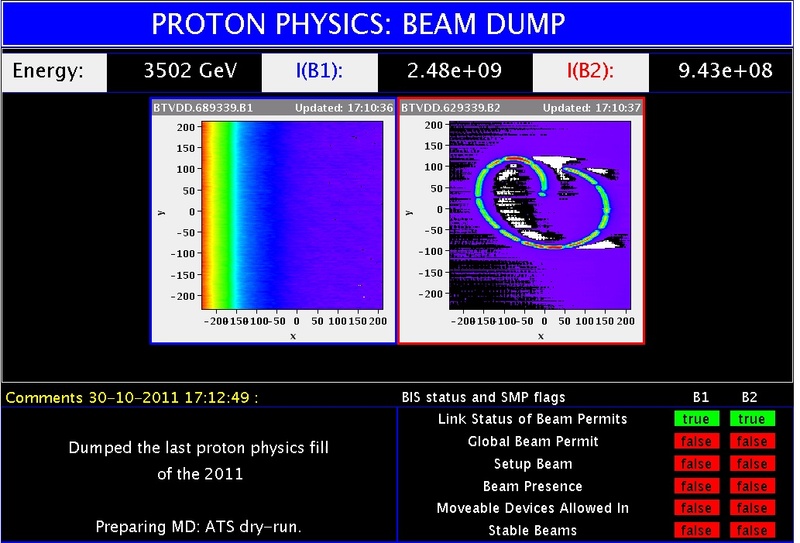 LHC control screen displaying the dump of the last beams for the LHC's 2011 proton run. The image on the right shows the cross section of the beam just before it was stopped. "At the end of this year's proton running, the LHC is reaching cruising speed," said CERN*'s Director for Accelerators and Technology, Steve Myers. "To put things in context, the present data production rate is a factor of 4 million higher than in the first run in 2010 and a factor of 30 higher than at the beginning of 2011." Physics highlights from this year's proton running include closing down the space available for the long sought Higgs and supersymmetric particles to hide in, putting the Standard Model of particle physics through increasingly gruelling tests, and advancing our understanding of the primordial universe. "It has been a remarkable and exciting year for the whole LHC scientific community, in particular for our students and post-docs from all over the world. We have made a huge number of measurements of the Standard Model and accessed unexplored territory in searches for new physics. In particular, we have constrained the Higgs particle to the light end of its possible mass range, if it exists at all," said ATLAS Spokesperson Fabiola Gianotti. "This is where both theory and experimental data expected it would be, but it's the hardest mass range to study." "Looking back at this fantastic year I have the impression of living in a sort of a dream," said CMS Spokesperson Guido Tonelli. "We have produced tens of new measurements and constrained significantly the space available for models of new physics and the best is still to come. As we speak hundreds of young scientists are still analysing the huge amount of data accumulated so far; we'll soon have new results and, maybe, something important to say on the Standard Model Higgs Boson." "We've got from the LHC the amount of data we dreamt of at the beginning of the year and our results are putting the Standard Model of particle physics through a very tough test," said LHCb Spokesperson Pierluigi Campana. "So far, it has come through with flying colours, but thanks to the great performance of the LHC, we are reaching levels of sensitivity where we can see beyond the Standard Model. The researchers, especially the young ones, are experiencing great excitement, looking forward to new physics." Over the coming days and weeks, the LHC experiments will be analysing the full 2011 data set to home in further on new physics. However, while it is possible that new physics may emerge, it is equally likely that the full 10 inverse femtobarns initially foreseen for 2011 and 2012 will be required. As in 2010, the LHC is now being prepared for four weeks of lead-ion running, but in a new development this year, the world's largest particle accelerator will also attempt to demonstrate that large can also be agile by colliding protons with lead ions in two dedicated periods of machine development. If successful, these tests will lead to a new strand of LHC operation, using protons to probe the internal structure of the much more massive lead ions. This is important for the lead-ion programme, whose goal is to study quark-gluon plasma, the primordial soup of particles from which the ordinary matter of today's visible universe evolved. "Smashing lead ions together allows us to produce and study tiny pieces of primordial soup," said ALICE Spokesperson Paolo Giubellino, "but as any good cook will tell you, to understand a recipe fully, it's vital to understand the ingredients, and in the case of quark-gluon plasma, this is what proton-lead ion collisions could bring."